Fig. 53 The ten different conditions of the quality test, ordered after their listener preferrence. See text for the meaning of the color code. We did a paired comparison preference test where we asked for the preferred audio quality of the presented stimuli, see [Raake2014] for details. The stimuli consisted always of the same acoustic scene with three individual sources, which had different degrees of impairments: no impairment (gray), medium degraded guitar (light red), degraded guitar (red), degraded vocals (blue). Those impairments were applied in different combinations to the three sources, see Fig. 53. The ordering in Fig. 53 also corresponds to the average listening preference for the presented scenes, where 1. is the most preferred scene and 10. the less preferred one. The result files contain always three columns, in the first two columns is the number of the presented condition (the number corresponds to the number at the beginning of the stimuli files). The third row contains a 1 or 2 indicated which of the two presented conditions was preferred by the listeners. We did a paired comparison preference test where listeners rated their listening preference for four different pop musical pieces presented by WFS, stereo or surround. The musical pieces were all mixed by the same person in order to try to minimize the influence of the mix on the ratings, but still trying to get the best out of every system, see [Hold2016a] for details. As this experiment was performed with real loudspeakers, there are no BRS files available with this experiment, but if you like to run a binaural model on the stimuli you can try the BRS files from 2016-06-01: Listening preference of different mixes of one popular music song presented by WFS (binaural simulation) which provide a anechoic binaural simulation of the loudspeaker array setup used in this experiment. 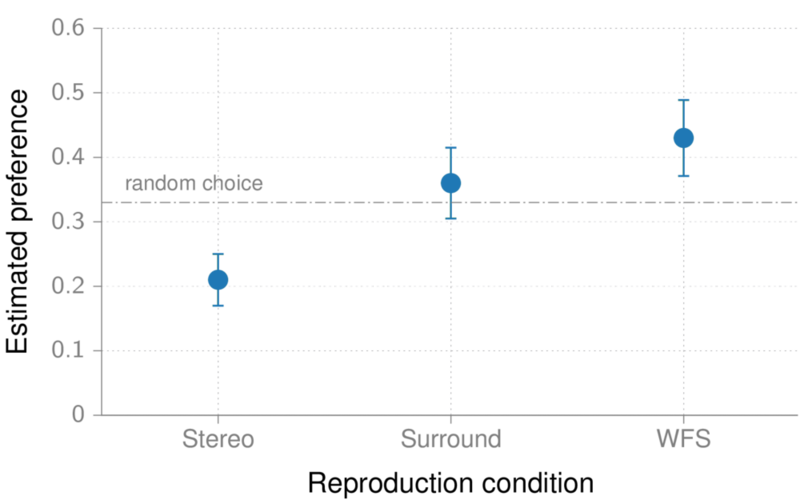 We conducted an experiment on the preferred listening position in a 5.0 surround setup. The experiment was performed in the studio like room Calypso in the Telefunken building of the TU Berlin. The experiment employed dynamic binaural synthesis in order to allow instantaneous switching between positions during listening. To accomplish this BRIRs were recorded before at nine different positions, see TU Berlin, room Calypso, 5.0 surround setup for different listening positions. 26 test participants rated their preferred listening position out of the 9 positions for every recording technique. They did this first without visual feedback using a GUI that only showed nine buttons where the stimuli were randomly assigned to. In a second run they had a GUI showing a actual sketch of the listening setup, similar to the sketch shown in Table 48. The BRIRs used in this experiment were not the one available under 10.5281/zenodo.160761, but an earlier version available under 10.5281/zenodo.49691. That earlier version had an error in the metadata of the stored SOFA files, resulting in the fact that the listeners were not looking towards the front at all listening positions, but facing always towards the center loudspeaker. As music material seven different simultaneously recordings of the piece “Maurerische Trauermusik K.477” of W. A. Mozart were used. The recordings differed in the applied recording technique, which are listed in Table 45 and were done at ORF (Austrian Broadcast, Vienna) and the piece was played by the Radio Symphony Orchestra Vienna. For more details on the applied microphones and for downloading all recordings have a look at [Wittek2015]. Fig. 55 summarizes the results across all listeners and recording techniques, showing only differences between with and without visual feedback. The results for the different recording techniques are summarized in this PDF. For more details on the experiment have a look at [Schultze2016]. We did a paired comparison preference test where listeners rated their listening preference for a pop musical pieces presented by WFS or stereo. For WFS four to five different mixes of the same song were presented for one run of the experiment. Those mixes were variations along one of the following mixing parameters: “compression”, “equalizing”, “reverb”, “changes of reverb, equalizing and compression to the vocals alone”, “positioning of musical foreground elements”. The musical pieces were all mixed by the same person, that also mixed the stereo and WFS reference condition, compare [Hold2016a]. The results for the “positioning of musical foreground elements” are discussed in more detail in [Hold2016b]. We did a paired comparison preference test where listeners rated their listening preference for a pop musical pieces presented by WFS or stereo. For WFS four to five different mixes of the same song were presented for one run of the experiment. Those mixes were variations along one of the following mixing parameters: “compression”, “equalizing”, “reverb”, “changes of reverb, equalizing and compression to the vocals alone”, “positioning of musical foreground elements”. The musical pieces were all mixed by the same person, that also mixed the stereo and WFS reference condition, compare [Hold2016a]. This experiment is very similar to an earlier one with the main difference that the earlier one used binaural synthesis to present the stimuli, whereby here we have used real loudspeaker setups.